Total investment in building construction edged up 0.2% from November to $13.7 billion in December. Gains in the residential sector (+0.6% to $9.4 billion) were offset by declines in the non-residential sector (-0.7% to $4.3 billion). On a constant dollar basis (2012=100), investment in building construction also edged up 0.2% to $11.6 billion. The total value of investment in building construction for 2018 rose 2.5% to $169.9 billion, following a 7.2% increase in 2017. 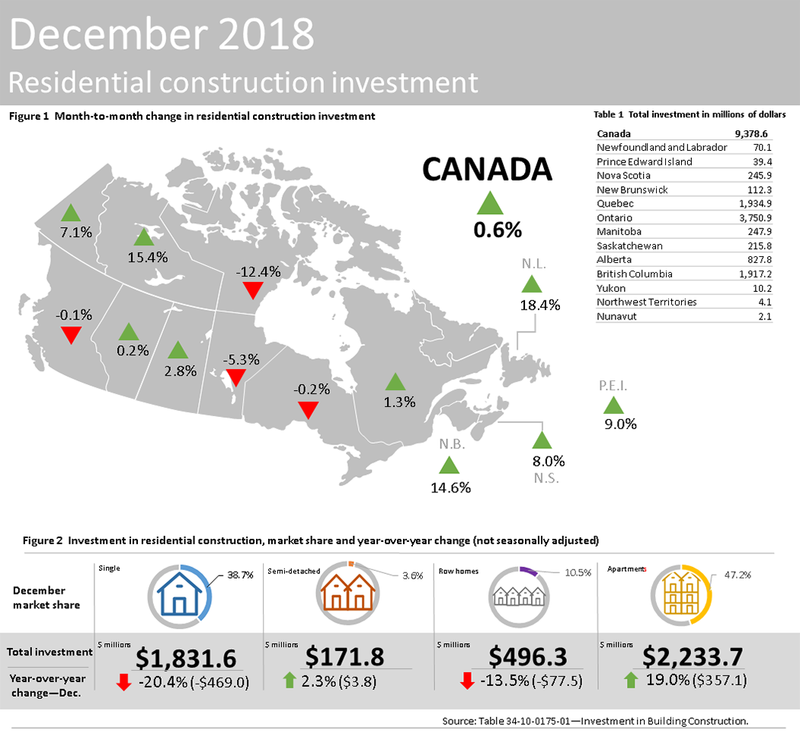 The slight increase in total residential investment for December was largely due to gains in Quebec (+$24 million), Nova Scotia (+$18 million), New Brunswick (+$14 million) and Newfoundland and Labrador (+$11 million), which were partially offset by lower investment in Manitoba (-$14 million) and Ontario (-$8 million). In the residential sector, investment in single-dwelling construction declined 0.6% to $4.8 billion, while investment in multiple dwelling construction (which includes doubles, row homes, and apartments) increased 1.9% to $4.6 billion. Year over year, investment in new construction decreased 3.1% in December to 4.8 billion dollars on an unadjusted basis, accounting for almost half of all investment in residential building construction (49.4%). This decrease was led by a drop in new construction of single family homes (-$469 million), as well as row homes (-$77 million). These declines were partially offset by increases in new home construction for apartments (+$357 million), cottages (+$33 million) and semi-detached homes (+$4 million). Provincially, the largest declines in new construction for single family homes were in Ontario (-$241 million), Alberta (-$110 million) and British Columbia (-$79 million), while increased investment in new apartments was concentrated primarily in British Columbia (+$165 million), Ontario (+$115 million) and Quebec (+$72 million). In the non-residential sector, the largest decreases in investment were in Ontario (-$34 million) and Alberta (-$14 million). These were partially offset by investment growth in British Columbia (+$19 million) and Nunavut (+$3 million). Investment in all three non-residential components fell, with the largest decline coming from the institutional component (-2.2% to $1.0 billion). 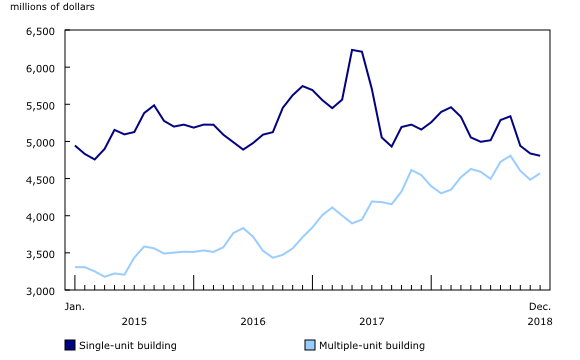 Compared with December 2017, investment in new construction decreased 4.8% to 2.1 billion dollars on an unadjusted basis and accounted for 46.9% of all investment in non-residential building construction. Compared with a year earlier, new construction of institutional buildings fell by $198 million, and was partially offset by increases in new construction within the commercial (+$65 million) and industrial (+$25 million) components. The decline in new construction of institutional buildings was largely the result of diminishing levels of investment in maturing projects for hospitals and schools, with fewer new projects to offset these declines. The total value of investment in building construction for 2018 rose 2.5% to $169.8 billion, following a 7.2% increase in 2017. The increase in 2018 was primarily due to higher levels of investment in multi-family, commercial and industrial buildings. 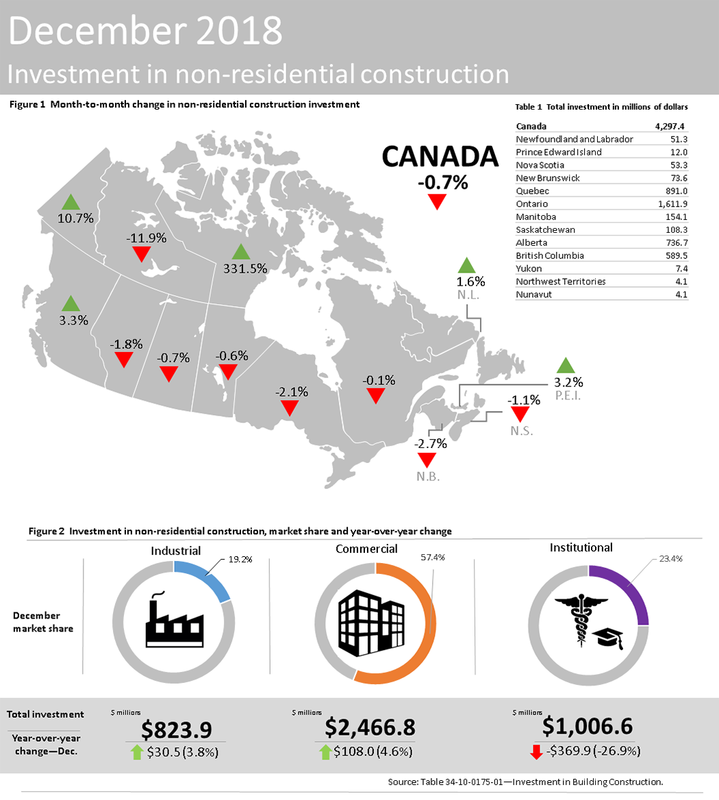 Six provinces showed an increase in total investment in building construction, led by British Columbia and Quebec. The largest decline was in Alberta, where total investment fell 10.1% to $22.4 billion. While overall investment in residential building construction edged up (+0.3% to $116.1 billion), investment in single family homes (-$4.3 billion) continued its downward trend in 2018, and investment in multi-family dwellings rose $4.6 billion. Over the past three years, investment in the multi-family component has been concentrated in Quebec, Ontario, British Columbia and Prince Edward Island. For 2018 the main driver of growth was an increase in investment in the non-residential sector, up 7.6% to $53.7 billion. This increase was led by continued growth in the commercial component (+7.3% to $29.3 billion) and a widespread increase in investment in the industrial component (+23.6% to $10.0 billion), as every province reported an increase. 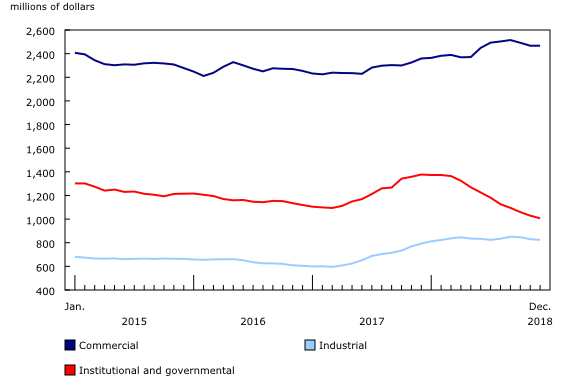 Among the provinces, Ontario accounted for 45.3% of total investment in the industrial component and almost half (49.6%) of the total gain for the component in 2018. This increase was led by investment in new construction of transportation/utilities (+87.7%) and mining and agriculture (+35.0%) buildings. Data presented in this release are seasonally adjusted and are expressed in current dollars unless otherwise stated. Using seasonally adjusted data facilitates month-to-month comparisons by removing the effects of seasonal variations. For information on seasonal adjustment, see Seasonally adjusted data – Frequently asked questions. 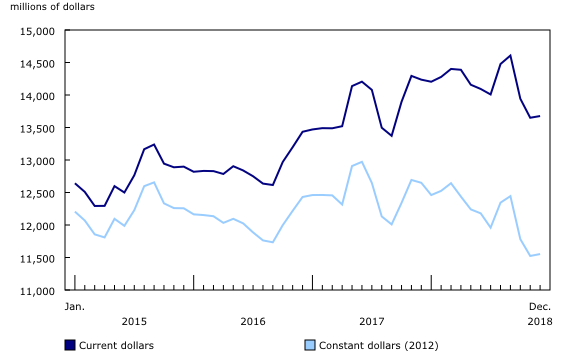 Monthly estimates for constant dollars are calculated using quarterly deflators from the Building Construction Price Index (18-10-0135-01). Typically, the first two months of a quarter use the previous quarters' price level and are revised when the new quarterly price index becomes available. Detailed data on investment activity by type of building and type of work are now available in the unadjusted current dollar series. As a result of data source constraints, the total value for "type of work – all" may not equal the sum of its parts (new construction, renovation, conversion, and other). The component required to complete the summation is "type of structure, minor." In the type of work series "conversions total," one or more residential dwelling units are created from an existing structure. Deconversions, garages and carports, as well as in-ground swimming pools, are grouped together in the "other types of work" category. Effective November 23, 2018, table 34-10-0175 contains data on both the residential and non-residential sector. It replaced tables 34-10-0010, 34-10-0011 and 34-10-0012. Data on investment on building construction for January will be released on March 21.